The former Russian President recorded an exclusive album of ballads in 2009. A single copy of the album was sold for $164,940 to support the his late wife’s charity, the Raisa Gorbachev Foundation. You can listen to the architect of glasnost sing the Russian classic, “Old Letters” here. Venezuelan President Hugo Chavez layed down an album of traditional folk music in 2007 titled “Songs For All Time,” which was available for free to the public. Two years later, the pop-singing populist returned to the recording studio and contributed two tracks to an album called “Battle Music,” a collection of songs supporting his United Socialist Party of Venezuela. Chavez is known for spontaneously breaking out in song, as he does in this YouTube clip, crooning about his relationship with U.S. Secretary of State Hillary Clinton. 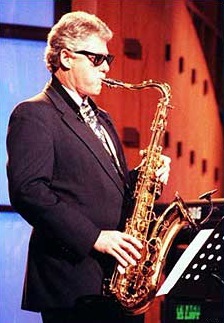 One of the most iconic images of the 1992 campaign was Bill Clinton in dark glasses playing the saxophone. Clinton was first chair in the Arkansas state band in high school, and briefly considered a career in music. In June 1992, Clinton donned his shades and belted out “Heartbreak Hotel” to a surprised audience on the Arsenio Hall show. The appearance endeared him to many young voters. The late West Virginia senator could make the catgut sing. Click here for our previous coverage of his fiddling. Former Senators John Ashcroft, Jim Jeffords, Trent Lott and Larry Craig formed a singing quartet in 1995, in an effort to build better relations inside the Republican party. (Lott was concerned that Jeffords had a penchant for voting with the Democrats, a concern that would prove to be legitimate.) The Singing Sentators probably hit their high point when they sang with the Oak Ridge Boys in Branson, Missouri in September, 1996. The group released a single album title “Let Freedom Sing” in 1998.